VFL R3 in 60 seconds Get a snapshot of Collingwood's thrilling four-point win over Footscray in 60 secs with Collingwood Media. This was the message Collingwood development coach Tarkyn Lockyer received from President Eddie McGuire at three-quarter-time in Saturday’s round three VFL clash against Footscray. The Magpies held a seven point advantage going into the final term but the Bulldogs had all the momentum after an eight-goal quarter. “I knew that Footscray were coming pretty hard at us so I didn’t really believe him but we found a way to win,” Lockyer told Collingwood Media post match. A game of football full of highlights eventuated in a four-point Collingwood victory as the side claimed its first win of the year. “For the boys to walk away with four points is really a reward for the effort they put in,” Lockyer said. A clash against the reigning premiers appeared no daunting task for the Magpies as they kicked six unanswered goals in the first quarter to open up a 35-point quarter time lead. Footscray found their composure in the second term as both sides went goal-for-goal in an entertaining quarter of football. Jordan De Goey continued his strong run of VFL form as he rotated with Alex Fasolo on the ball and up forward. De Goey kicked 14 goals in nine matches in his 2014 season at the Oakleigh Chargers in the TAC Cup. His scoring prowess was once again on show today as he kicked two consecutive goals in the second quarter and another just after half time. At the other end of the ground, Lockyer highlighted the efforts of an ever-changing defensive outfit. The assistant coach highlighted the leadership of Jonathon Marsh before acknowledging the effort of the defenders against a potent Footscray attack. “He’s been pretty consistent. He showed some really impressive signs last year and then unfortunately hurt his hammy,” he explained. In a frenetic final term, Brenden Abbott and Ben Kennedy kicked goals for the Magpies to extend the lead back out to ten points. The Bulldogs kicked a late goal through Jarred Grant and were on the attack again in the middle of the ground when the final siren rang out over Victoria Park to confirm a Collingwood victory. 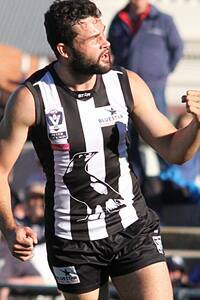 The win marks the Magpies first in 2015 and fourth consecutive win at Victoria Park. The side will once again be on the road next week when it takes on Geelong at Queen Elizabeth Oval in Bendigo.